Local Scoreboards in the Cloud! The Cloud is driving change! 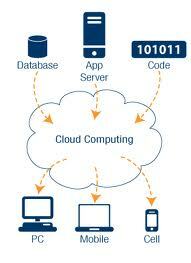 The Cloud - as it has become known - is changing the way that we do everything. As a comprehensive and highly redundant technology infrastructure, it is both highly reliable and ubiquitous. It offers an efficient process and mechanism for the management of bits of data across many platforms and distribution points. Calendars are nolonger something that we maintain in Outlook or some other desktop application. Calendars are now maintained within cloud services with multiple and diverse client devices and applications. Changes you make on your desktop are immediately reflected on your smartphone and vise-versa -- and are also immediately updated on the layered views of any subscribers. This same technology is driving change to our contact lists, our weather reporting, how we create and maintain our documents, and how we store our personal and corporate data. Virtually anything that is represented by either static or dynamic data is moving to cloud-based systems to allow diverse client and subscriber methods and devices. The Virtual ScoreBoard Network (VSBN) is bringing this same technology to the local ball game through the concept of The Virtual Sports Scoreboard. 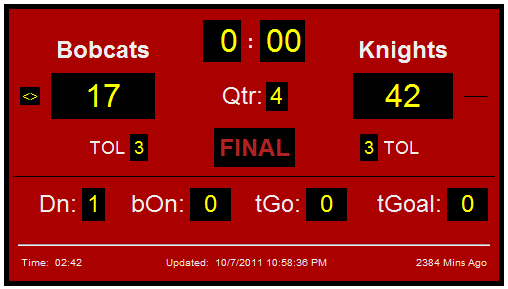 The game Scoreboard is a lighted physical piece of hardware on the wall of the gym or at the end of the field. But, the information that it conveys can now be digitaly represented in the cloud. Interested viewers then display the game scoreboard from their computer, smartphone, or tablet in live time. Scoreboard appliances may be deployed for public display in distributed locations. The physical scoreboard remains. But, the methods by which it operates is changing. Future controller consoles may simultaneously post score data to both the physical scoreboard, and also to the VSBN for distribution. And, scoring systems themselves will take the form of mobile apps, computer programs, and distributed appliance displays. Get started today by placing your next game in the VSBN. This does not replace any physical game scoreboard. You will assign a person to relay the scoreboard information, and then publish the game number and/or links to all interested parties. Your designated person then updates the virtual scoreboard using their smartphone, viewers at home, at the game, or at the mall can see the virtual scoreboard from any internet-connected device. Please visit The VSBN Project for information on direct-linking your scoreboard controller.